When a fly-covered canvas bag floats to the surface of North Carolina’s Mountain Island Lake, forensic anthropologist Tempe Brennan is called to the scene. Animal remains? Or could this be related to bone fragments from a human male found nearby? To Tempe’s surprise, the decomposed body indicates the person was a female young adult. The profile fits the description of a missing graduate student named Edith Blankenship. Was Blankenship murdered? If so, why? Blankenship’s body turned up on an artist colony where an eco-radical named Herman Blount has been squatting. Blount has posted online rants threatening to blow up a power station he says is polluting the area. Is Blount capable of violence? Blankenship was a loner, but she proved a dedicated advocate for birds at UNC–Charlotte and the Carolina Raptor Center. Did Blankenship’s passion lead her into danger? Alongside Detective “Skinny” Slidell, Tempe puts life on hold until she discovers the truth behind Blankenship’s death. But Tempe’s own passion for crime solving will lead her into danger of her own. 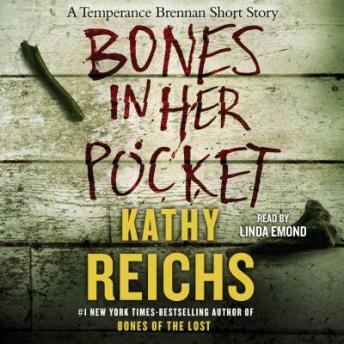 Bones in Her Pocket is an exhilarating new installment in the Temperance Brennan series.